Many people express a fondness for ginkgoes (Ginkgo biloba). Perhaps it is their unique foliage, their outstanding fall color or their interesting botanical history. Ginkgoes have a fan shaped leaf with prominent veins radiating from the juncture of the leaf blade and the petiole (the stem of the leaf). The leaf is sturdy and seldom bothered by insects. In autumn, the leaves often change into a beautiful yellow to gold color. Furthermore, in many autumns, the leaves will all fall off in a matter of hours, which is unique to ginkgoes. 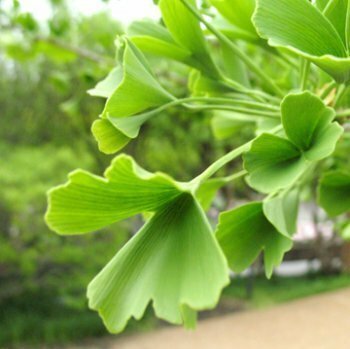 Ginkgoes have a fossil record going back 200 million years, with fossils even found in North America. When ginkgoes are mentioned, the foul smelling nut of the female tree is often mentioned. In the East, the ginkgo nut is eaten and is thought to have medicinal value. In the West, it is the ginkgo leaf that is thought to be useful in memory preservation. Despite potential health benefits, in the West, many prefer to grow grafted male clones to avoid the foul smelling nuts. 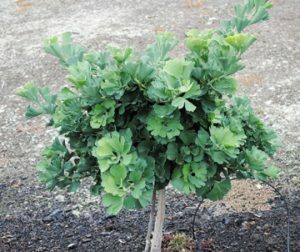 Ginkgoes are long-lived, large growing trees, however, there are quite a few selections known as cultivars that are miniature, dwarf or semi‐dwarf, which make them great additions to the home landscape or rock garden. ‘Mariken’ – This form has particularly dark green leaves with a compact branch structure. Sometimes this from is grafted on a short stalk or standard, which brings this compact grower a bit higher off the ground. ‘Troll’ is a similar form. ‘Weeping Wonder’ – There are few true weeping ginkgoes with ‘Weeping Wonder’ and ‘Ross Moore’ being the best. ‘Weeping Wonder’ has an assortment of different shaped leaves: some leaves are typical fan‐shaped, others are needlelike and everything in between. ‘Weeping Wonder’ can be trained upright on a bamboo stake—creating a small pyramidal tree with weeping branches. ‘Witches Broom’ – Over fifteen years this tree can reach 8‐10 feet in height with heavy thick branches and larger than normal deep green leaves. ‘Munchin’ ‐ also known as ‘Chris’ Dwarf’, this form has probably the tiniest leaves with some leaf blades only one-quarter inch in length. This tree tends to be more open growing and might be best suited for a collector. ‘Chase Manhattan’ – This form also has small leaves but larger than ‘Munchin’ and will reach 6 feet in 10 years. ‘Tubliformis’ – this interesting form has leaves that are rolled into tubes, hence the name. Ginkgoes are slow growing trees than can appear a bit awkward in youth. With proper training though, and patience, any of these forms can grow into an outstanding feature for your garden. 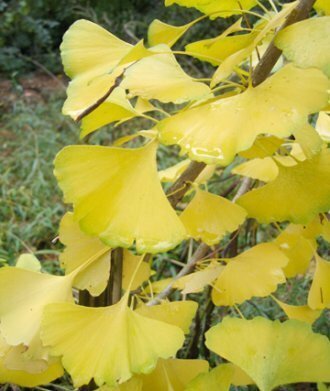 These ginkgoes can be found in specialty nurseries in the Triangle area. John Monroe is the owner of Architectural Trees LLC in Bahama, NC, a specialty nursery.